The Marine Biotechnology ERA-NET held a stakeholder meeting in Brussels, coinciding with the launch of the recently completed European Marine Biotechnology Research and Innovation Roadmap. The meeting built on the key elements of the Roadmap and featured a wide range of speakers from international industry and the research community. Session 1: Marine biotechnology, an industry perspective. With the aim of stimulating innovations based on the use of marine biotechnology to explore and maximise the use of marine bioresources, speakers from different industry sectors described how they use a range of novel marine materials in commercial applications. Session 2: Creating a marine biotechnology business. The challenges of building a business venture based on marine biotechnology are the focus of this session, which included presentations on financing a new biotechnology enabled venture, managing knowledge transfer and intellectual property in addition to case studies presented by two marine biotechnology driven high-potential SMEs providing novel products to vastly different global markets. Session 3: Supporting marine biotechnology RTDI. Leading industry practitioners gave their perspectives on the future opportunities to develop new research tools and infrastructure; novel processes and applications in the health, food and food ingredients sectors. Session 4: ERA-MBT and other EU supported marine biotechnology projects. 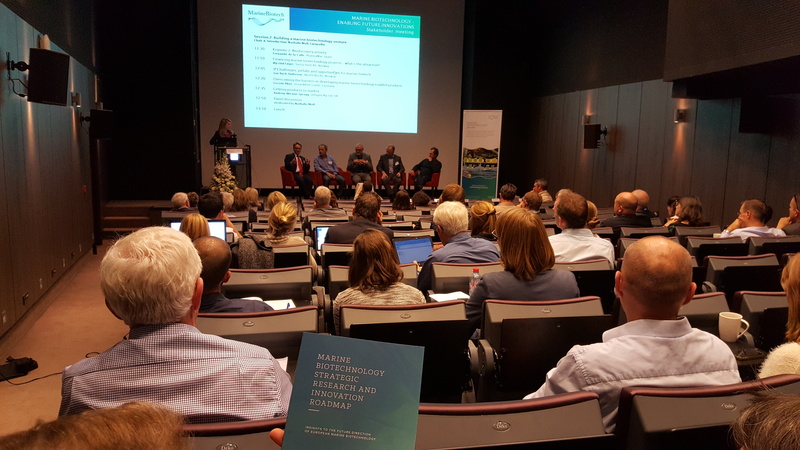 Participants learned of the impacts and outputs from some of Europe’s major publicly funded marine biotechnology research projects and heard of the progress on projects funded by the first ERA-MBT call for research proposals. Session 5: Future research opportunities and setting priorities. Highly interactive sessions focused on mechanisms to support marine biotechnology and set priorities for marine biotechnology research and innovation. The stakeholder meeting, coincided with the launch of the recently completed Marine Biotechnology Strategic Research and Innovation roadmap that was launched 12th October at 16:00 in Hotel Marivaux, Brussels.